Cuisine Royale is an all-kitchen-warfare Battle Royale game with the most honest system for Loot Boxes ever. It's made by developers of squad based MMO shooter Enlisted. Mostly Positive (283) - 77% of the 283 user reviews in the last 30 days are positive. Mostly Positive (12,546) - 76% of the 12,546 user reviews for this game are positive. “The game is still a work-in-progress, but we want players to participate in open testing and hear player’s feedback. This will help us greatly to improve all aspects of Cuisine Royale. — Are you planning to rework the damage mechanics? Some types of weapons have two indicators (stopping power and penetration), and others do not. For example, AR rifles, all PP and M1 models are currently ineffective. Yes, we plan to rebalance all the damage mechanics as soon as we get to the new damage model for the player model. Then we can get normal indicators for stopping and damaging force of projectiles, as well as the indicators of armor penetration and other things. — What inspired you when you created such a cool map like Mexico (especially the jungle part)? — Is it possible to add vehicles like motorcycles or armored vehicles? Possibly armored vehicles and way less possible for motorcycles, as we don’t want to spend our time on development of theirs physics. — A long time ago, Alexander talked about the system of replays, which can be used in CR. Will it be possible to add a similar system for ordinary players to create good videos and screenshots? It is difficult to say, because in this case, we will not only have to significantly expand the interface in the replay system, but also to support it. In any case, this will not happen before the final release. — When will the 3rd season begin? Not yet, we’re working on fixing stuff, so season 3 will be closer/with the release of the game. — Are there plans to improve the “movement” of the players? We plan to improve player movement in terms of animations: adding jumping/falling animations, adding more natural movement animations. But we also going to work on more vaulting techniques, like vaulting through small windows (attic windows for instance) and some improvements for crawling too. — Will there be a separate mode with a first person view? — Will there be a separate custom shooting range released in the game? For example before battle where you can test all the weapons movements etc. We are considering such as an opportunity but there are no concrete plans to implement such feature at the moment. — Will it be any possibility to send the bug reports from the in-game interface? — Will the vehicles cause any damage to the players? We have plans to implement this feature in one of the upcoming updates. — Will it be possible to run private server? At the moment we do not currently have plans for this. — Will be new modules (like speed kneecaps, bouncing slippers, Cuban cigars, etc.) added to the game? We will add new “perks” for sure to the game just in case to diversify the gameplay. Follow the news on our main page and on our social media sources. — Which weapons do you plan to add to the game? 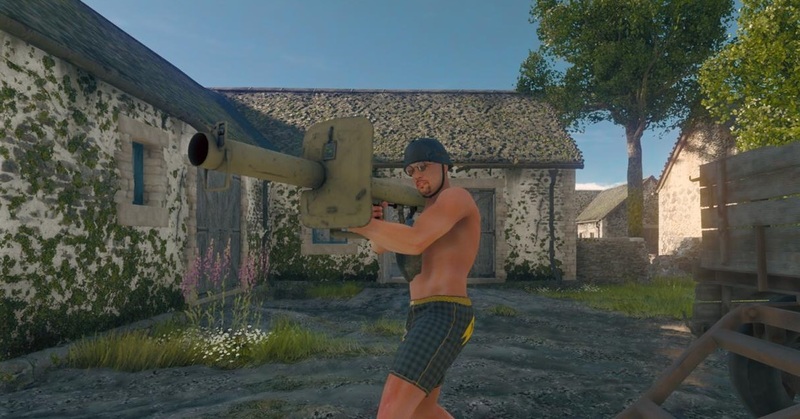 In one of the closest updates we plan to add a bazooka. Then we plan to add the Lee Enfield and will explore the possibility of implementing other types of weapons in the game: such as flamethrowers, mortars. — Will jetpack return into the game? Used in the april fools event. Probably, yes, but a little bit reworked. — Will there be changes to the bags so that they do not override the view (for example in sniper view)? First of all, we want to fix the bug when, for example, bags or spoons were unwound and interfered with the view whilst moving quickly. — Will weapons ever be modified (not just sights, such as silencers)? The weapons of WWII were never largely modified, but we want to give the possibility to do some changes in the future as soon as we are done with more pressing problems. — Can you talk more about the new location “Mexico”? Mexico is twice the size of Normandy in its playable area, it has a little more loot due to this and it is a different kind of terrain: desert, jungle, ruins, city, fortress, mountains. We are planning to release Mexico on the PC together with the game's release this year, so let's hope we can do it this summer. Please notice that the map "Mexico" was available to xbox players only for a limited time. — Is it possible to introduce different weather conditions? Yes, we want to add rain and fog to the game. — Is the rebalance of the frying pan expected? Yes, we are going to change the behavior a little bit so its doesn't have to be such an unambiguous factor in winning. — Will there be an opportunity to resurrect the teammate? So far, we plan to allow this only with the use of special items. — Will the possibility to view the replays be implemented? At the moment we didn't plan to release such feature, at least not before the game's release. — Will the shooting (recoil, scatter, damage) be improved in the future? Yes, it will be for sure. We are working on it. The ”Wild West” season has begun! Cowboys, bandits, sheriffs, native americans and other heroes of the prairie will fight each other to see who is celebrating their victory over the fallen. There is the first female character in Cuisine Royale - Annie “Pin-up” Ashley, a menace to all careless cowboys. Will she fight side by side with Clyde “Dozen” Mullican or will she try to conquer the Wild West on her own? Cuisine Royale is an all-kitchen-warfare Battle Royale game with the most honest system for Loot Boxes ever. It's made by developers of squad based MMO shooter Enlisted and is completely free. In battles, you get ingredients that are used for "cooking" new suites, masks, gestures and other cosmetic items that don't influence your combat effectiveness. Stand out from the crowd! In battles, you get ingredients that are used for "cooking" new suites, masks, gestures, tombstones and other cosmetic items that don't influence your combat effectiveness. You can also purchase optional "kitchen pass" that increases rewards per battle and unlocks additional recipes. Fair play: you can play Cuisine Royale in first and third person view. In order to mitigate advantage of the latter, every player has a minion with a camera that can uncover the position of a player who is peeking around a corner. So if you see a butterfly or a drone - you should know that you are being watched. Massive and intense battles: 36 players per session in total will head out from different parts of the map, starting only in their underwear and making their way to the center of a battlefield that is constantly shrinking in size. © 2019 Gaijin Network Ltd. All rights reserved. Cuisine Royale is a trademark of Gaijin Network Ltd.